In the business world this is very true. People often forget that it is the collective efforts of certain individuals that govern the success or failure of a team. 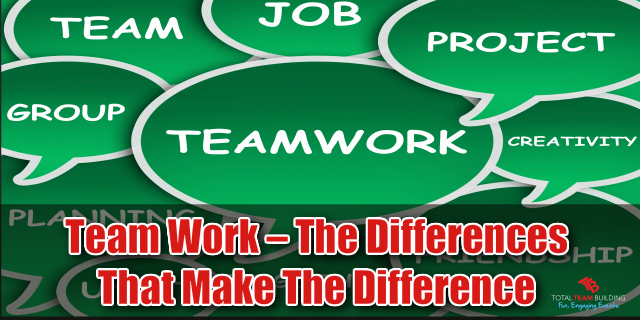 In today’s day in age team work and having a common goal is the vital cog needed to drive business and productivity and I will show you how a simple mental shift is often all that is needed to put teams on the path to effective team work. In untrained teams it’s often the differences that cause teams to lose focus and direction when it comes to success and productivity. If a clear, common goal, something that everyone understands and believes in is not established right from the start then the individual differences in terms of expertise, skills, gender, age, beliefs etc…will prove to be a problem because no one will truly know their role and different team members will have different expectations based upon their own perceptions and beliefs of their team mates which can lead to a lot of in fighting and a team being unproductive, this creates a snow ball effect. However in trained successful teams, when a clear, common goal, something everyone understands and believes in is set, it gives everyone a sense of purpose as achieving the goal is clearly the reason the team exists and everyone is dependent upon each other’s expertise, perspective and efforts to achieve the goal. When you think about it a business is made up of many roles and expertise – financial experts, planners, sales, marketing, technical wizards and customer relations. The power lies in when there different perspectives and skills are effectively and efficiently put together to solve problems and challenges. The results can be truly amazing, in fact the quality of decisions and the level of creativeness and inspiration generated by teams is substantially better than from the general individual working solo. A trained team will be more productive, generate greater results and will be far happier as they will be part of a success and winning culture. Total Team Building specialises in corporate team building activities and games that enhance team work.